You can easily choose and configure different pop-ups to display on all pages or certain pages of your website. This plugin is optimized for speed to use just one check, instead of multiple checks if the displayed page is post, page category, archive etc. We match the pop-up display with the current displayed Url. Create as many pop-ups as you want to display on all or specific pages of your website. You can choose to display any pop-up as a modal box, top bar, bottom bar, left panel, right panel and box on top left, top right, bottom left or bottom right. You can choose differnet background color, text color, link color for each pop-up and make them unique. You can also specify padding for content and width of the pop-up to overwrite defaults. You can choose to show a pop-up on all pages of your website or specify each Url where you want to display the pop-up. You can choose to show the pop-up as soon as the page is done loading all elements or you can specify a number of seconds to delay the pop-up display. You can choose from around 66 different types of animation styles to display and hide the pop-up. You can specify different animation of pop-up in and out event. If you don’t want to bug your users by displaying a pop-up again and again on a page or site, you can block a pop-up by sepcifying a number of days for cookie expiration. You can choose to show a pop-up within a specified datetime range. This is best if you are promoting any event or contest etc. You can specify a css .class-name or unique #id for a pop-up and include the class or id to any clickable HTML element. Pop-Ups with click events will only show on click event for the element and will not display on page load. 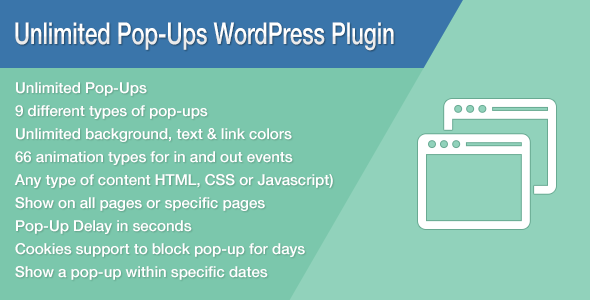 You just need to install and activate this plugin and you will see a custom post type named Pop-Ups below Posts menu. You can then create, edit and delete pop-ups as we normally do with other posts. Front-end display is all user generated content, however, if you wish to translate the admin area to another language, you can easily edit the .po file with POEDIT software. This entry was posted in Uncategorized and tagged bottom bar, database, feeds, forms, HMTL Pop-Ups, media, modal box, php, scripts, sliders, top bar, wordpress panels, WordPress Pop-Ups by Acty. Bookmark the permalink.